Have you always wanted to model for a big brand like Macy’s? 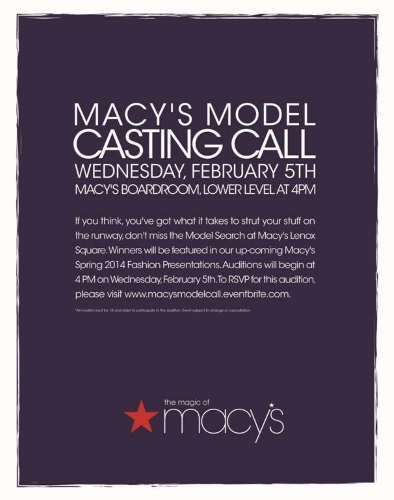 Here is your chance because Macy’s will be holding an open casting call for models! The 2014 Spring model search is on. The model casting is looking for models that the chain can feature in their Spring 2014 Fashion presentations and models will have a chance to walk the runway at their events. Models who want to be considered need to come on down to the Macy’s Boardroom in Atlanta. They are instructed to bring 2 professional headshots, yes, they want professional pics for this. To be considered, show up at the event and take your shot at being featured in a runway fashion show. Model auditions will be held in Atlanta Georgia at the Macy’s department store on the 5th. The Macy’s store is in the Lenox Square Mall. Since 1959, Lenox Square® has been the premier shopping destination for fashionistas throughout the Southeast. Located in the heart of Buckhead, Lenox Square offers an unparalleled shopping experience. In 2013, Lenox Square embarked on a multi-phase renovation project, where shoppers can see the beautifully revamped main entrance taking shape right before their eyes. If you think, you’ve got what it takes to strut your stuff on the runway, don’t miss the Model Search at Macy’s Lenox Square. Winners will be featured in our up-coming Macy’s Spring 2014 Fashion Presentations. Auditions will begin at 4 PM and will end at 8 PM on Wednesday, February 5th in the Boardroom on the Lower Level in Macy’s. -Everyone please bring two professional headshots and be ready to walk. We look forward to seeing you strut! I would like to model macys clothes. I want to know where can I take my daughter to model for ads. Hello, My daughter Beyoncé is taking modeling and acting classes currently at John Casablancas career center out of Oakbrook, IL. We are currently looking for any casting calls or modeling auditions to start her off.